The MAI®2MIX-MERKUR offers the highest mixing quality in a universal concrete mixer, suitable for use with all common sack mortars and easily transportable to the jobsite. It has a maximum mixing capacity of up to 25l/min and a maximum grain size of 4mm. 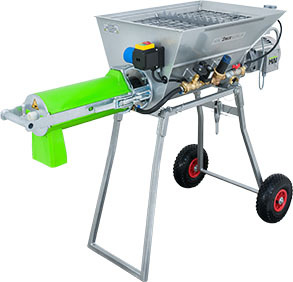 Also take a look at the MAI®2MIX-MERKUR-PLUS, a small cement mixer for fine materials. 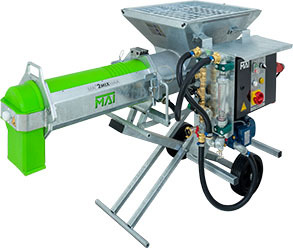 The MAI®2MIX-MAIA-MOBIL is part of the latest generation of robust and dismountable continuous single shaft mixers, producing perfect mixing quality every time. It has a maximum mixing capacity of 40 to 80 l/min and a maximum grain size of 6 mm (or 8mm although increased wear is possible at this level). Modern construction and engineering projects require modern cement mixers and MAI has developed a range of horizontal continuous mixers for every jobsite. Continuous mixers are fully-automated machines that continuously mix dry premixed mortar into a workable compound. The main areas of application are masonry mortar and adhesives. They are an essential part of modern plastering systems. Stationary cement mixer machines may be fed manually from a bag or from a silo in the case of mixers with silo attachment. Or consider our innovative automatic conveying systems. MAI has developed a range of continuous mixers that meet the most exacting requirements on the building site. Discover the MAI horizontal continuous mixer that will earn its keep on your jobsite. Talk to us about the range of high-tech MAI cement mixers and how MAI can make your project more efficient.